We like to say flotation therapy meets you where you are. If you come in super stressed and hurried, you’ll likely spend a good portion of your float just calming down. Sometimes that’s all floats are (I know mine have been), and that’s okay and useful in its own right. Sometimes, however, you might hope to go a bit deeper and get more out of your float. Which might mean you put in just a little extra effort before, during, and after. Skip the stimulants: Caffeine increases adrenaline levels in the body, so if your goal is to calm and reset your body and mind, caffeine will add an extra obstacle. Exercise first: Exercise releases endorphins, which have a positive effect on mood, including feelings of anxiety and depression. Especially if this is your first float, exercising first can release some jitters and calm your mind. Set an intention: An intention is different than an expectation. An expectation, if not met, leads to disappointment. An intention is a promise to focus on something and to be aware of how your body and mind respond. While you’re floating, keep coming back to your intention. Control the temperature: The float environment is designed to match your skin temperature, so don’t take a super hot pre-float shower or the water will feel chilly. Conversely, if you feel too warm during your float, simply rotate your head to toward the opening. You’ll get a little breath of fresh air through the slight crack where the pod lid meets the base. Remember you’re in charge: You can keep lights and music on for your entire float if you want. Or you can choose one but not the other. Or you can go back and forth! Work backwards: Especially if it’s your first float, it can be beneficial to work slowly into a more sensory-restricted environment. Maybe keep lights and music on for several minutes, then move to darkness, and finally cut out music. We recommend you at least experience no lights and no music once during your float. Most floaters find the space feels especially large and open when it’s completely dark, alleviating any concerns of claustrophobia. See red: The red light is a great option for those who aren't ready for complete darkness as it emits the least light wihtout being "I can't see my own hand in front of my face" dark. Studies show blue light can disrupt nocturnal melatonin production (the hormone that regulates your sleep cycle), whereas red does not. We’re happy to show you how to easily choose your light color. Remember the color you choose before going lights off will be the color that turns on at the end of your float. The dim red is the most gentle way to signal your time's up. 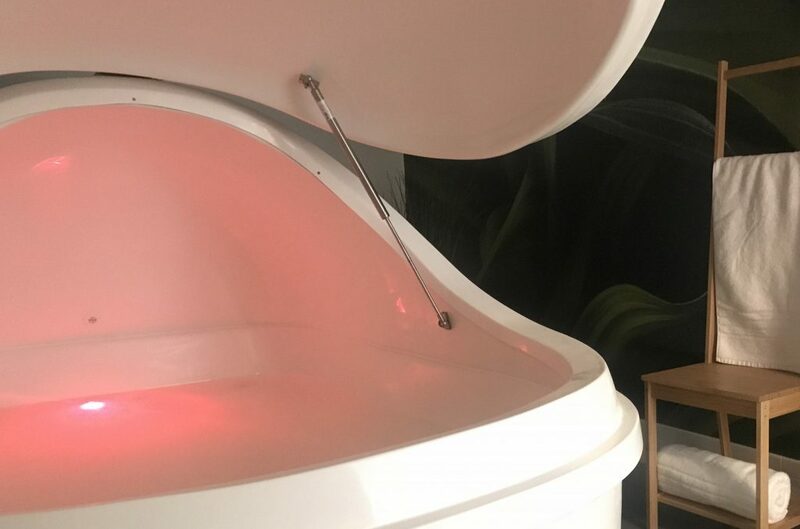 Go with a guide: I float for anxiety, which means I often enter the pod under some mental anguish. Listening to a guided meditation can help usher me into a calmer space. Another trick is to focus on your breathing, whether the sound of it or the count of in breaths versus out. Many of our customers also decrease pre-float anxiety by coming with a buddy. Our Float with a Friend package is one of our most popular options. Play with positioning: Floating doesn’t necessarily mean laying stock still for an hour. We offer neck pillows if you like a little more support, and I personally play around with arm positioning throughout my float, especially at the beginning. “Cactus arms” aka the “I surrender” pose are my favorites. It’s also nice to do some small “C” stretches or to run your hands over your skin, made soft and slippery by the many hundreds of pounds of Epsom salt in the water. Abandon expectations: A surefire way to have a hard float is to expect it to be easy. Every float is different, no matter how many you’ve done. Stay curious. Don’t rush off: It's arguable that the post-float reflection period is the most important part of a float. We’ve got tea or water waiting for you. Take a little extra time to let your senses slowly reacclimate to reality. Bonus points if you can delay checking your phone! Pay attention and ask questions: How does your body feel? What about your mind? Were you able to fully relax and let go or do you have some work to do in that area? Were your later responses to your friends, family, and frustrations your “typical responses”? How did you sleep that night? How are your pain levels? Jot it down: Journaling helps move passive thinking into active engagement. Even a few sentences on a piece of scratch paper will help you clarify your thoughts. A float is more than the number of minutes you’re in the tank. It travels with you. You can likely get more out of your float if you put more in. I haven’t floated for seven days, but even writing this has been a reminder of why I do—just writing about floating has taken me out of a full day’s worth of up-and-down panic. For me, floating has become a practice and a tool like so many others I use to keep myself healthy, and for that, I am grateful. If there’s anything we can do to improve your float experience, please ask. We'd love to hear what steps you take to get more out of your float! Comment below or share your tips with us on Instagram, Facebook, or Twitter. Thanks for these tips Michelle. I’ve floated a couple of times already but this is super helpful. Especailly the “You are in charge” part. There’s no rules I can do what ever I want! It’s true! There’s no “right” or “wrong” way to float. It’s your room, your pod, and aint nobody gonna tell you you’re doing it wrong!